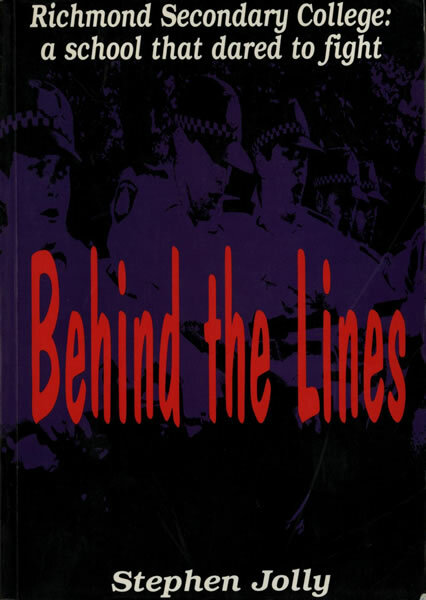 Behind The Lines is a book written by Stephen Jolly published in 1996. 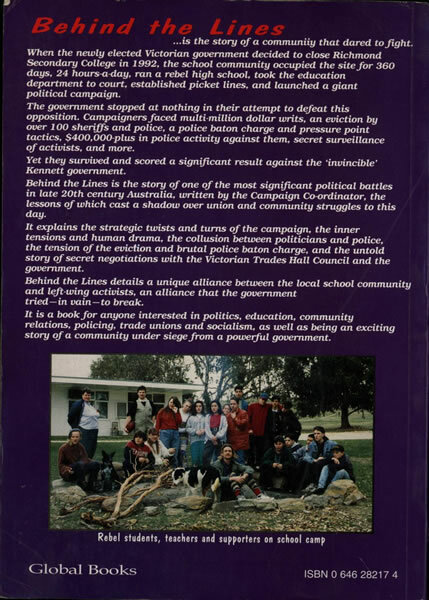 When the newly elected Victorian government decided to close Richmond Secondary College in 1992, the school community occupied the site for 360 days, 24-hours-a-day, ran a rebel high school, took the education department to court, established picket lines, and launched a giant political campaign. Behind the Lines details a unique alliance between the local school community and left-wing activists, an alliance that the government tried – in vain – to break. Includes appendix, chronology of events, bibliography, plus index. Shortly after coming to office in Victoria in 1992, the Kennett government announced a range of cuts to public services, which included closing 55 schools. One of the schools targeted for closure was the Richmond Secondary College (RSC). Teachers, parents and students at Richmond had other ideas. For almost a year, they occupied the site and ran a rebel school, frustrating the Directorate of School Education (DSE) bureaucrats and their political masters, who originally planned to demolish the school and sell the land to private developers. Only the fact that people were prepared to fight stopped those plans in their tracks. While other schools were occupied in the immediate aftermath of the closures, only the occupations at Richmond and Northland survived long enough to pose any sort of threat to the Kennett government’s agenda. A leader of Militant and one of the main participants in the campaign to save RSC, Jolly gives us insight into how it unfolded. We get a good feel for the debates that were a constant theme of both the occupation and the aftermath of ” Bloody Monday”, when picketers were violently attacked by the police. Jolly also gives a good feel for the continual tension faced by the occupiers and a horrifying glimpse of the police tactics leading up to and including the infamous baton charge on December 13, 1993. Not only did the DSE have no intention of reaching agreement with the occupiers, but it and the Kennett government were only too willing to use force to get their way. Of course, the campaign has to be seen against the broader struggle to reverse the Kennett government’s attacks. Jolly goes into detail about the sell-outs of the union officialdom, despite the willingness of the membership to fight. The VSTA branch, for example, stood behind the Richmond campaign, while the leadership shied away from any meaningful industrial action. The lack of a real fight against Kennett by union leaderships is part of the reason the Richmond campaign became increasingly isolated. The Trades Hall picket lines were only too quickly abandoned once the possibility of a settlement with the government emerged. Jolly’s assessment of the role played by other left groups, however, leaves something to be desired. His biggest complaint is that we didn’t all drop everything else and make Richmond our sole priority. For an organisation of a few dozen people playing a leading role in such a struggle, it is easy to mistake that struggle as the battle of the month, year or even decade. But in fact the class struggle continues in other arenas as well, and it would be foolish of the left as a whole to pretend otherwise. But three years on, the campaign to save Richmond Secondary College remains a source of inspiration for those who do not accept the neo-liberal agenda of cuts. As a description of that campaign, Jolly’s book is well worth reading.